This is a space for you, my clients and potential customers, to have your say about my work and to offer suggestions for any improvements or other services I could offer. Now this camera was a real treat to discover. I remember my dad using this one a lot. Mum had placed it in the care of my sister for safe keeping many years ago when she went off on an extended holiday and never remembered to ask for it back. 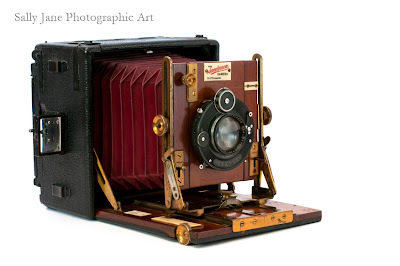 I had always assumed, like the other camera, that this had been sold after my father's death with his business. So when my sister came with an old leather box a couple of days ago I was so pleased to discover what was inside. The camera is a Sanderson Regular Hand & Filed camera built around 1904 so it would have been old when my dad had it. It took either glass plate film or hand cut film measuring 5 x 4 inches. 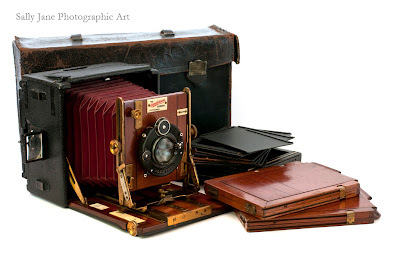 Sadly I only have one of the negatives that was taken on this camera although my mother believes she had some of the glass plates stored away somewhere. With such large negatives the camera was capable of recording vast amounts of detail which is why my father used to use it despite it's age. One Interesting feature it has is it's ability to tilt shift the lens. 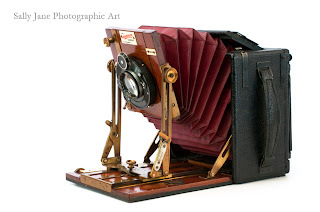 Although my knowledge of this kind of camera is very sketchy I believe this would have been used when taking wide angle shot to counteract the distortion. For instance, when taking wide angle shots of buildings the walls tend to lean out or lean in depending on what angle you hold the camera at. Tilting the lens helps to correct for that. Today, a tilt/shift lens will set you back hundreds of pounds for a SLR camera but here it was incorporated into the design. This particular camera has had a few modification made to it. I'm not sure the lens is original as they were often swapped and normally they had a brass view finder mounted on the base board but on this camera that has been removed and a glass view finder has been placed on the outside of the case as seen in the top image. Still, the camera appears in remarkable good condition and, if I could get film for it, I'm sure it would still take brilliant images. I'm glad to have had the opportunity to photograph it. It will now be returned to my mother's care or, placed on loan to a museum. I never see such camera before however i will try to read more about this camera which looks best for long distant shots. Married to a great guy, Paul. No kids but two dogs.